For all-inclusive or customized pre arranged vacations ask our Travel specialists. They are aware of different discounts and preferred rates. 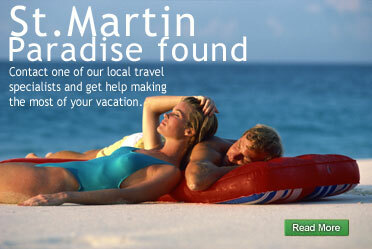 They have insight and knowledge and many years experience booking vacations. Book an Island Tour with one of our local Tour operators and enjoy a custom designed informative and exciting trip around the island. Touring with a knowledgeable guide or at the least, an informative brochure, is a great way of taking in some of St. Martin's unique cultural and ecological heritage. Tours of St. Martin island by land, sea, and even air are widely available and make for fun day excursions. Besides all kinds of diving and sailing tours there are plenty of interesting spots on land to visit. The Butterfly Farm on the French east coast is a popular destination, especially for kids or what about visiting a real Plantation from 1786. For a little history lesson, wander around Marigot, Grand Case and Orléans, the largest and oldest towns on the French side, respectively. Touring the Pic du Paradis in the French mountains. This complex of farmland and forest is perfect for a day's hike and the view from St. Martin's highest peak is beyond compare. Cruise Packages have Something for Everyone - Visit Martin & St. Maarten!